"... the mandala of Anubis, actually exists on at least four dimensions at once. Progression of complexity from simplicity is geometrically accelerated and ramified. As all maps of Self are ultimately false, nevertheless, some are useful to elucidate c ertain truths, and so are Holy. The Book of Anubis, though Holy, is subject to these limitations." In the beginning was the Self. Like a circle whose bound is never known; ecstatic and super-abundant is its "feeling." Whose center is ever fed by its boundless aura. Like unto no other, super-abundant, self-nourishing, procreating only onto itse lf, ever becoming more itself. By the immensity of its unknown bound, this formlessness is the archetype of form. This Holy formlessness is the fuel of its center, its freedom, its infinitude. And, verily, this center is the primal belief of the formless, the desire of the Self. And verily, this formlessness is the primal belief of center, the Vision of Self. Time and motion and evolution are the perceived effects of the super-abundance of Self, the Ever-Becoming One. No thought or conception can reach this Self for it precedes conception and forms. Nothing is outside this Self in its primal oneness; as empty belief, as ecstatic Self-love. Therefore, are all selves, entities, beings, and things its ramifications, its multitude of beliefs and forms. In its primal ecstasy of Self-love, Self has conceived of itself its duality. "For I am divided for love's sake." Yes, it has conceived of itself its force and form, its Will and Imagination, its primal duality for "love's sake." For the primal un ity is the essence of ecstatic love as the experience, the emotion. And the primal duality is the original means of its expression. Beliefs are "forms" of Self, containing and expressing desire. Desire or Will is bound in belief. As Self conceives it creates dual beliefs of greater complexity, and of necessity, greater intelligence to unify the components of belief. Intelligence is the ability for components of a belief to intereact. As conception creates dual beliefs of greater and greater complexity, first structure, then life, then intelligent life is built up. But the component beliefs of the sphere (or system) of living, intelligent beliefs are small and many in their cap acity to believe. The first belief is division, producing duality (Will and Imagination). The second belief is synthesis, expressed duality, producing tetragrammaton. By this process complexity and intelligence are built up from Self. Eventually beliefs reach a sphere of organic "life" and intelligence. What we usually call "ourselves" (Identity) is a complex and intelligent belief. Yea, and here is a great mystery. For in its ever newness, Itself's ever-becomingness, It has accumulated its past forms of belief, it has stored these in Itself. For memory is the essence of Soul, its order intelligence and continuity. And in the multitude of beliefs that is self's manifold expression of desire, what we call "ourselves" and other selves, and these past beliefs and incarnations of Self exist in the memory of Self called Soul. Memory is the essence of what we call the "subconscious" and is one and the same with desire energizing a belief and becoming accessible to intelligence. Memory and the subconscious exist in the successive spheres of belief that start just outside "yourself" and extend concentrically out and back. Self's force is the energy of its desire, self-desire ever leaping into form. Ever energy is encoded, containing information, ever desire becoming belief. Ever is belief surrounding self as it's ever-changing body, and this multitude of beliefs an d forms all have Self for their center, yea, they all have the same Self for center. But the multitude of diverse and reacting forms/beliefs give the impression of multitudinous self and myriad entity to intelligent beliefs. Simple beliefs are of large capacity to believe though relatively unintelligent. Complex beliefs are of small capacity to believe though intelligent. Capacity is "sacrificed" to intelligence and vice-versa. The primal dualities are the parents of all, while "we" build machines in a small corner of the universe. Vital Beliefs are all those forms of belief (being forms of Self) that are not perceived by "ourselves" (a complex, intelligent belief) as being Self. Therefore what we usually call "ourselves" is a complex, intelligent belief, capable to some degree of believing in turn. But we can only truly believe one thing at a time, for thoughts (being the name that we, having been believed give the belief s that we in turn believe), are dual and conception has occurred. We are only free to believe before conception has occurred. This is in relation to the sphere of complexity we are in at the time of conception. In each unity of belief there is only enough energy to awaken (make real or vital) one of the dually a rising beliefs at the moment of conception. Even though in time they may alternate, they cannot exist simultaneously. Ask yourself, "is it raining outside?" In the moment before you look you are free to think that either is or it is not. Once you look you are free to believe only one or the other. In quantum physics this is known as the collapse of the state vect or. This is the relationship of a complex, intelligent belief to a less complex and vital belief of encoded energy in physical forces. This less complex belief is considered objective phenomena while "ourselves" seem subjective in respect. Suppose, then, that as we look at the rain we think, "I wish it were not raining." That is we desire from a complex, subjective belief to affect a change in a simpler, vital belief. Experience has shown us that we cannot, in the normal state, believe effectively in opposition to a simpler, vital belief. For though the simpler, vital belief has less intelligence, it has more capacity to believe than a complex belief. We might be able to use our "power" or "medicine" which is intelligence to stop the rain, but as yet intelligence has not developed the means. We might persist, desire being strong enough, and attempt to develop the means, but in all probability it would have stop ped raining of itself long before we had developed the means, or, we would have ceased to desire the change. "Ourselves," as a complex belief actually exists on all the spheres of complexity/simplicity at once. As belief progresses from sphere to sphere, as complexity increases, more and more energy is bound up to maintain the complexity of the belief. T his energy bound to complexity is what we call intelligence. Therefore, complex beliefs are less and less aware (immediately) of other beliefs as Self. For energy must be available to belief for it to become "real," that is, Self. The formula of Magick is that energy must reach the sphere of a belief preconceptual to the belief desired. This requires that complex beliefs become simple. Degrees of simplicity equals availability of energy and capacity to believe. In fact, the y are the same! To try to energize a belief without reaching the required simplicity is either totally unsuccessful or exhaustive of the belief that is trying to affect the change. This exhaustion is a desired state as it frees the energy necessary to charge the new belief, but the new belief must be coded in terms not immediately intelligible or much or all of the energy will be re-focused to maintain the rational structure in which the desire is formulated, and will again tie up the energy (desire). Symbols ar e better than intelligent thought. Sigils are more potent yet for this purpose. Care should be taken in the means of exhaustion so that the complex is not permanently damaged but simply exhausted. Sigils may be made in a variety of ways. Unfamiliar languages, coded music, enumerations, special geometrics, mudras (provided they are not too "intelligible"), and many others. (Use your living imaginations). By these means we may acquire the capacity to believe "it is not raining" (or whatever) or better yet "the sun is shining" or "the air is dry." It is not wise to use a negative of the belief we wish to change as energy may affect the positive rat her than the negative, i.e. the "raining" rather than the "not". Symbols are useful to make accessible to our belief knowledge, information and/or experience of other beliefs as we may desire. Symbols are forms either pictorial and accessible to intelligence or arbitrary and intelligent by constant use in intel ligent systems. Energy made available through exhaustion and linked to a symbol reformulates in intelligence (within a complex belief) and is experienced "subjectively." Subjective beliefs are components of complex beliefs. Complex beliefs are preconceptive in relation to subjective beliefs. Therefore, subjective beliefs can be affected by "thought" i.e. the energy bound by intelligence. What are called affirmations are used to energize (through exhaustion) one subjective belief as opposed to another, as beliefs always exist as dual. To constantly repeat to ourselves "I am happy" will bring about the desired happiness provided tha t one is capable of focusing though effectively and energetically and that there is no hidden conflict with a more vital or simple belief. Some affirmations of a complex belief are usually undetected. These include such things as moral codes, aesthetics, of an intelligent belief conglomerate/system, i.e. "culture." Be not ruled by a hidden belief. 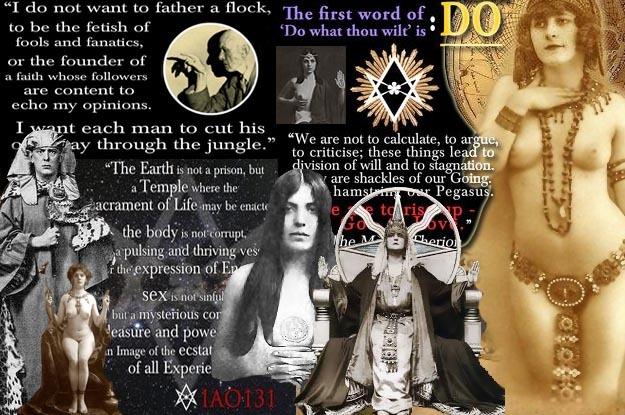 To affect the "objective" world of vital, simple beliefs requires total exhaustion of the intelligent belief "ourselves" - a kind of total oblivion, ecstasy or "death" of ourself and the released energy informing an unintelligible symbol or sigil. "You will perform great works, though they not be known. By being the true self all things come of their own momentum. "Verily, I am where you put your pen, and I am in the setting sun. When you look and search for me, you look only for yourself - your self free from the association you make. "When you look for me I am the Empty Places. When you be, I am there, ever-becoming, ever taking fresh forms. "You divide yourself by a process of reflection from me and are ever empty, searching, desiring. Revert, then, to a time before divisions - a time of wholeness and joy. "Wind yourself like the serpent coiled to spring. But when you strike, let go. Let go of all. Let go of self and then shall your will no longer suffer from opposition. For what is there to oppose? "In the silence that is death new life is born, and those embracing death are free. "New tools I make from the crucible of your soul. Let light come from darkness, ever fresh, let it take form and serve its purpose, then let its death be its reward. "Ever onward winds the serpent of life, ever devouring what was, ever growing new skins, ever sloughing off old."